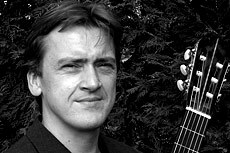 Hans-Werner Huppertz is one of the most versatile guitarists of his generation. He had his international debut by winning the 1st prize at the international guitar competition "Seto Ohashi" in Okayama/Japan und his 2nd prize at the 33rd international guitar competition in Tokyo. Since then he performs all over the world as a soloist and chamber musician, teaches in numerous master courses and is jury member in international competitions. An important aspect of his artistic work is his dedication to the repertoire originally written for the guitar, which he continuously aims to extend inter alia by dealing with new compositions. Besides his profession as an artist and teacher he works as a music producer and is one of the publishers of the "Edition Mejoru". Furthermore he is the artistic director of the Festival "AquisGranGuitarra" and of the renowned concert series "Accordate" in Aachen.